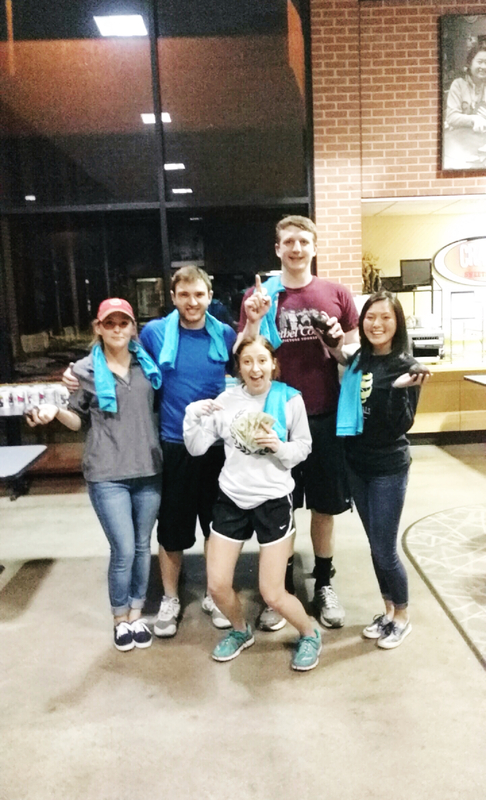 May 16, 2016 by Kiley Varney in Campus Life, Events, Uncategorized | Comments Off on Iron Chef 2! Last spring I posted about Iron Chef because it was so much fun and I thought it was so cool that we had such an awesome and different event on our campus. This year, it was announced that Iron Chef would again be part of Spring Fling — a week of activities toward the end of the school year. I wasn’t going to participate in Iron Chef this year because I was feeling the pressure of assignments and end-of-the-year tasks to complete. However, I got asked to be on a team and I agreed to join in. I’m so glad I did! Not only was Iron Chef a blast, but my team ended up winning first place! We were given 45 minutes to cook up an entree that had to contain 3 secret ingredients: chicken, avocado, and pineapple. We also had acc ess to a HUGE variety of other foods and spices to help make our dish delicious. There were things like eggplants, strawberries, mangos, rice, eggs, and so many other foods available for us to use. We had a burner to cook on, as well as pans, bowls, knives, and several other kitchen utensils. My team consisted of myself and 4 of my fellow SGA members. We ended up making an Asian-Pacific grilled chicken on a bed of sauteed greens with a side of avocado pepper salsa in a mango bowl. We knew our dish was good, but we didn’t think we’d win first place! The judges scored team’s dishes based on several factors, including taste and presentation. I guess ours had it all! We had more teams participate this year than we did last year. I think everybody that was there would agree that this event is one that needs to keep happening every year! What’s there to do around Newton? May 16, 2016 by Kiley Varney in Uncategorized | Comments Off on What’s there to do around Newton? If you’re new to Bethel or not from around the area, you may find yourself wondering what fun stuff Newton, Kansas has to offer. Although it is a pretty small town, there’s more to do than you might think. If you’re needing to get off campus for a while and go have some fun, you’re reading the right blog post! 1. Half-price appetizers at Applebee’s. I never fully understood the beauty of getting a full order of mozzarella sticks for $4 until college. My friends and I average going to Applebee’s about once a week. The food is cheap, and really good. Plus, it’s really nice sometimes to just go out and eat at a restaurant with your friends late at night! You can get half-apps on weeknights 9pm – midnight and weekends 10pm – midnight. 2. Druber’s Donut Shop. This is a beloved Newton classic that’s been around for a number of years. This unique donut shops opens its doors at 11:30pm every night (except Saturday night) and stays open until 2:30 pm the next day, and Saturdays they stay open until 11am. The donuts are the best and are very affordable on a college student budget. 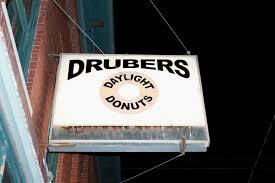 If you’re craving something sweet at 2am, go check out Druber’s. 3. CaNewton. As you may know, the Sand Creek runs through Newton and has become a popular place for walking and fishing. Last summer, I discovered that a couple had opened a canoe and kayak rental business from their backyard, which overlooks the creek. My boyfriend and I rented a couple canoes and set out on the Sand Creek for a couple hours and it was a blast! There are plenty of canoes and kayaks to rent for a good price. With the weather getting warmer, it’s the perfect time to check out CaNewton on Facebook and get out on the water! 4. Kauffman Museum. Located right across the street from Bethel, this place is one you’ll want to visit during your time at Bethel. They’ve got great permanent and traveling exhibits, as well as a tallgrass prairie reconstruction with a great grasses and wildflowers. The museum is even open on weekends! Next time you need a study break on a Sunday afternoon, head on over to Kauffman. 5. Disc golf courses. As you probably know, we have our very own disc golf course on campus that is just incredible. What you may not know though, is that it’s been expanded to 18 holes now! If you’re an avid disc golfer and want to check out other courses in the area too, there are a few others around. About a half-mile away from campus is the 9-hole course at Centennial Park just off of Kansas Avenue. Out south of town, there’s a 24-hole course at Camp Hawk. If you’re willing to drive a few miles, Hesston (north of Newton) has a 10-hole course on the Crosswind Conference Center property. This list is just a glimpse of the fun things to do around the Newton area. Newton also has a bowling alley, several restaurants, parks, and places to shop! My friends and I sometimes go to Wichita for a fun day or night out also. Wichita is big and has tons of things to do. 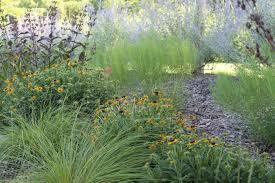 One of my favorite things in Wichita is Botanica — a beautiful and large botanical garden. So get out there and explore. See for yourself all of the great things in South Central Kansas! 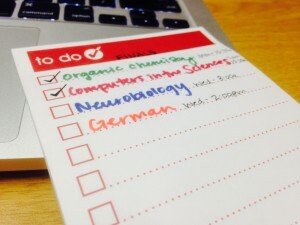 April 28, 2016 by Kiley Varney in Academics, Campus Life | Comments Off on What’s in my backpack? I guess it’s kind of a popular thing right now for blogger/vloggers/whoever to talk about what’s in their bag. I watched a doctor who maintains a popular blog and Instragram account that I follow do a video of what’s in her bag and I really liked it. 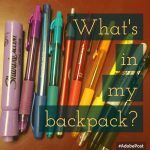 So I’m going to share with you what’s in my backpack! Most days, I leave my room in the morning and don’t return until the evening or night. Although it’s at most a 5 minute walk from anywhere on campus to my room, I don’t usually make the trip back during the day. Between classes and work, I’m usually going right from one place to the next, so I like to have everything I need for the day with me in my backpack. There are lots of places on campus where you can use a computer. Sometimes though, it’s nice to know that I can use my laptop no matter where I am. Plus my files that aren’t on Google Drive are on my laptop, and all of my favorite sites are bookmarked in my browser. 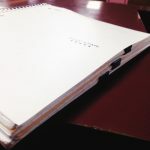 I buy big notebooks with dividers so that I can keep all of my notes in one place and not have to use different notebooks for different classes. It’s easier for me to keep track of that way! When a professor assigns homework or tells us when an upcoming exam will be, I can pull out the planner that Bethel gave everyone at the start of the school year to write it down. I forget things if I don’t put them in my planner or in my phone! I’ve got all kinds of colored pens. I’ve heard that color helps with memorization, and I’ve seen this to be true for me. So sometimes I take notes or make study guides in color to help me remember the material and also just make it more fun to look at. My online homework requires an audio portion, so I need earbuds for that. Sometimes picking a good study music playlist on Spotify and earbuds is the best way to hit the books, too. So I can have my favorite cup of tea while I’m studying in the library! Everyone is different, but for me, being busy means feeling happy and like I’m making a difference. I did not learn this until I got to college. I don’t mean that being super stressed out all the time is what brings me joy, because it certainly doesn’t. However, doing things — be it activities or work — that benefits others as well as myself gives me a feeling of satisfaction and purpose. Getting involved in college can help you meet people — friends, mentors, etc. Campus involvement can also build up your resume, earn your some extra cash, and also just be really fun! Of course, the amount of involvement and how it correlates to one’s happiness varies from person to person. Here’s just a list of what I’m involved in, why I do it, and how you can get involved if you’re interested. There is a lot more to Bethel than just the things I’m involved in though, so I’ve provided a link that can help you find out what all Bethel has to offer you. Whether your interests are in theater, math, board games, or anything and everything in between, Bethel’s got something you’ll love. Once I got to college, I decided that I was going to get involved. This was one of the best decisions of my life. I had heard about this thing called Student Senate (now called SGA), and found out that elections were coming up, so I decided to run. I got elected as a Freshman Senator and immediately loved the atmosphere of the meetings and loved the work that this group was doing that I got to be a part of. I just got elected as the Vice-President of the Study Body, and I can’t wait to start on my work in my new role. I, along with the other members of SGA, get to be a direct part of making changes that students want to see at Bethel College, and that to me, is so cool. We get to meet with Administration and lots of other important and amazing people at the college, as well as work with our other SGA members and peers who we can learn so much from. Plus, being on SGA is a great way to gain leadership experience. It’s not only a resume booster, but it’s also an opportunity that you can gain experiences from that will last you a lifetime. If you’re interested in being a part of SGA, check out our website. You can also chat with current SGA members to find out what SGA is like and what we do. A.k.a. Science, Technology, Engineering, and Mathematics. This is a scholarship that people who are interested in STEM fields receive from Bethel. However, it’s so much more than just a scholarship! If you get the scholarship, you get to be involved in undergraduate research through the STEM Learning Community, which is something that not a lot of larger universities can offer to many students. STEM Learning Community students get to work directly with seniors on their Senior Seminars, as well as create posters for the projects. These experiences are crucial to learning research techniques as well as how to present scientific findings. Being in this community also means having great opportunities to form close relationships with professors, which can turn into even more opportunities. If you’re interested in learning more about STEM, talk to any of the professors in the science department. Even if you’re not interested in a STEM field, check out what other departments have to offer students as far as scholarships and extracurricular activities. A lot of departments have opportunities for participation outside of the normal class schedule. A.k.a Student Alumni Association. SAA is a large organization on campus that is involved with all kinds of events ranging from Fall Fest to the Annual Alumni Phonathon to the Mudslam Volleyball Tournament in May. 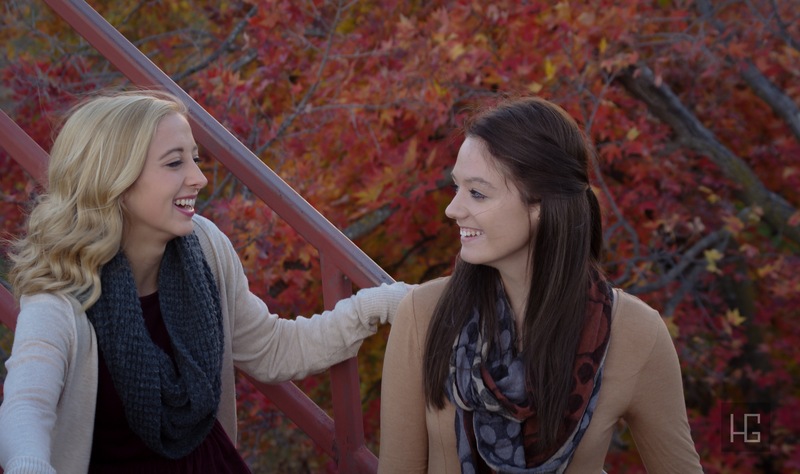 Through SAA, there are tons of opportunities to give back to the Bethel community, meet and connect with alumni, serve in leadership positions, and even make some money calling alumni! Professors and coaches nominate students for SAA. There are lots of people involved in SAA, so if a professor or coach sees that you would be a good fit for the group, then you might just get nominated. I’ve dedicated a whole post to this one before. Being a college athlete, no matter the sport, can offer you a wealth of opportunities. From learning time management, to helping you stay in shape, to allowing you to meet more people, athletics does it all and more. I run cross country, and I owe it to the sport for helping me make friends and get involved at Bethel. If you’re interested in playing a sport, talk to the coach of that sport or people already on the team. This is something that is so valuable that is usually done on your own time, outside of the classroom. Shadowing has been so beneficial for me, because it helps me see what it’s really like to be a doctor and what the dynamic is like inside of a hospital. No matter what field you’re interested in going into, following someone around who has the job you want can teach you a lot more than just doing a Google search of your future career. Bethel also offers a grant to students who are willing to sacrifice the time that they could be working and making money to doing an unpaid internship/shadowing position. If you’re interested in learning more about the grant, talk to your advisor. You can also ask them about connections that they might have with alumni or businesses that would love to have a Bethel student come shadow them. Finally, jobs are a great way to get more involved with campus, and make money! My on-campus jobs include my job within SGA, working both the chemistry and the biology departments, working as a library assistant, and blogging for Bethel (what I’m doing now). Through these jobs, I have met a lot of great people and formed connections that I’m very thankful for. I’ve also gained a lot of really valuable skills (and made money!). If you’re interested in getting a campus job, check out the campus jobs database here. Also keep an eye on the emails sent out by Career Services, as they often have on-campus jobs as well as off-campus opportunities for students. You can also talk directly to professors and other employees at Bethel to see if they could offer you a job in their department. These are just the things that I am involved in on campus, but there are so many more opportunities out there! Check out this list of campus organizations to find out more ways to get involved and find what works for you. Also, if you are wanting to start your own organization, check this out. That’s what I thought to myself when I heard tragedies on the news. My small town of 3,700 people in South Central Kansas would never have to face anything like that. Our town had good people. Our town did not have anything of interest for someone who would wish to cause harm. 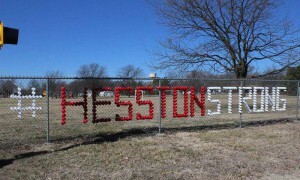 Thursday, February 25th, my hometown of Hesston, Kansas, encountered a mass shooting. Bethel’s text alert system sent out a notification just minutes after the shooting had occurred, informing us that there was an active shooter in Hesston but no danger was posed to Bethel’s campus. I was at dinner in the Caf when I got the text. The shooter was at Excel, a large company that manufactures lawnmowers. It was a little after 5pm. I contacted my mom, who works in Hesston just a couple blocks away from the Excel plant, to make sure she was okay and to ask if she knew anything about what was going on. She assured me that she was fine, and filled me in on what had happened in Hesston just as she was leaving. I was relieved to hear that she was safe. I was very saddened though to hear about the victims and those involved in and affected by the shooting. In the hours and days following the event, the details of the tragedy became public and it was clear what had happened. I don’t want to explain everything. I’m sure I don’t need to explain everything, as the story made national news. What I do want to say though, is how encouraged and impressed I am at the support surrounding Hesston. Companies here in Newton have posted signs with “#HesstonStrong” — a symbol of support to the community. Numerous social media posts have shared similar support, and a billboard on I-135 Southbound is currently showing love and care for the community as well by displaying the “#HesstonStrong” design. Many people on campus who knew that I’m from Hesston asked if I was okay, and if my family and friends were safe. They asked if I knew anyone who was affected. The support of the Bethel community was amazing. This community is one that shares in joys and sorrows alike, and that is really important. It’s so comforting to live in an area that cares so deeply and is so resilient even in the face of devastation. Hesston’s people are strong and their faith and hope is remarkable. 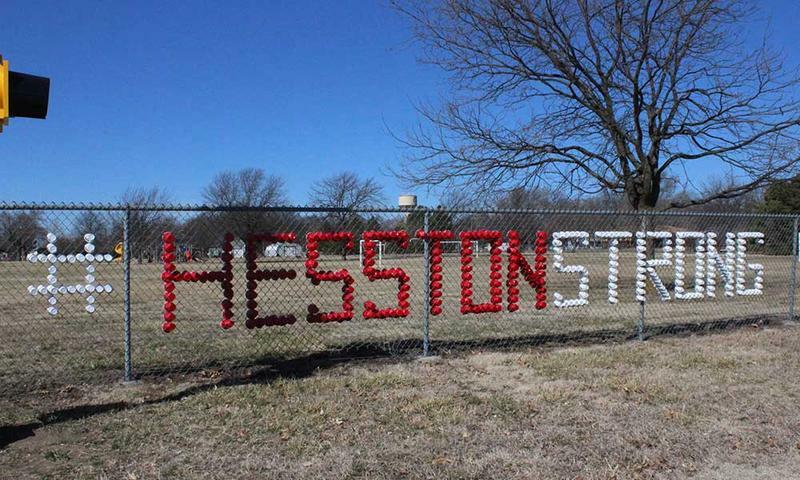 The surrounding communities and people across the nation have shown what it really means to be a neighbor and that is part of what makes Hesston strong. Hesston and it’s people have endured a great deal. They have served each other with loving hearts and helping hands and will continue to do so — all the while staying #HesstonStrong. While it may not be the case for everyone, college is often a time when you don’t have a serious full-time job, piles of bills or children to be responsible for. For those of you that do have those responsibilities, I commend you! You are an incredible human and I hope that you can take away at least a little bit from this post. But if you’re living on campus and trying not to think of the loans you’ll be paying back in a couple years or so, then your financial responsibilities are probably the lowest they will ever again be in your life. Get a campus job. There are seriously so many. On Bethel’s campus, there are opportunities to make money everywhere. Check out the campus jobs database to see a good list of the jobs available. Even if the database says there are no current openings, e-mail the supervisor listed if you are interested. A lot of times they will keep you in mind if there is a sudden opening or if they need extra help. Career Services e-mails out community jobs as well, such as picking up sticks at someone’s house after a storm or doing housework for an elderly couple. One of the best things about being in college and having a job (especially a campus job) is that people are extremely understanding of your schedule and are very flexible and willing to work with you. Ask around — there is something out there for everyone, even if it’s a couple hours a week. Eat smart. If you’re on a campus meal plan, get your money’s worth! I go to the Caf almost every day for breakfast (as well as lunch and dinner most days), which is a meal that a lot of people skip. Eating breakfast not only helps me not only have energy for a busy day, but it also assures me in knowing that I’m getting what I pay for with the meal plan. If you want to do something different, try making something in the residence hall kitchens. You can buy a box of pasta and a jar of pasta sauce for pretty cheap, and cooking it/eating it makes you feel fancy. If you want to go out to eat, don’t get the most expensive thing on the menu. Take what you don’t eat back to your room and put in your fridge for when you get hungry at 11:30 p.m. (because we all do). Also check out the Applebee’s late-night menu. You can get a whole order of mozz sticks for under $5! Have style on a budget. The shoes I’m wearing right now? Five bucks on the clearance shelf at Target. My shirt? Marshall’s, $6. 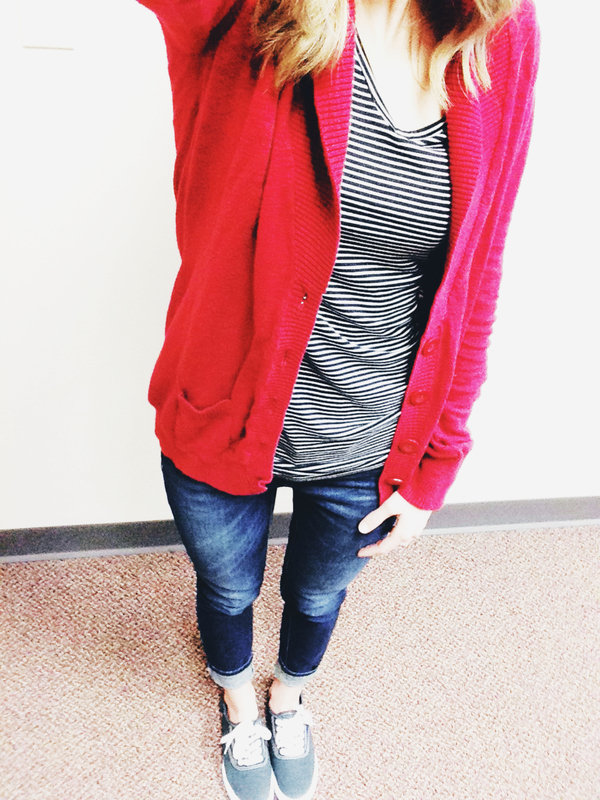 My cardigan? Free — my friends hosted a “clothes swap” where we all brought things we didn’t wear any more and put them out for grabs for any of us to take. What didn’t get taken was then donated to our local thrift store. Speaking of thrift stores, they are also great, especially on a college budget. It might take some time to find stuff you like, but take a study break and go buy a couple new things for your wardrobe for super cheap (plus, thrift stores = recycling clothes = happy earth :)). I’ve found some great items at Et Cetera in Newton. Bargain shop for textbooks. Are you buying/renting your textbooks exclusively from Amazon or Chegg? While these are great companies and do offer good deals, sometimes (not always) there are cheaper options out there. 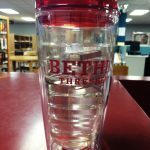 Bethel has its very own student-run Facebook page called Thresher Exchange. This is a place for students to buy and sell textbooks as well as other things such as couches, TVs, fridges, etc. If you’re in need of a book, post on Thresher Exchange and see if anyone on campus has it! They’ll probably sell it to you cheaper than the big book companies. Also, search online for deals on textbooks. I got my Molecular Genetics textbook from a lesser-known rental company called Campusrentals.com, and it only cost me $11 (versus about $30 with other rental sites). Sell your stuff! That guitar you never play anymore and never will again? Sell it. How about your bike that you never ride, or that iPod you got several years ago, or the many textbooks from classes past? Sell them! Post them on Thresher Exchange, Harvey County Buy/Sell/Trade, or similar places to make a few extra bucks. If you’re offering a good price, someone will probably pick up what you’re putting down. Hope this helps. I know I’ll be trying to follow my own advice and save up for that weekend trip to Colorado! I’ve got two more finals to take before I get a well-deserved, long Christmas break from school. Part of me is dreading even starting to study for those last two finals, but part of me is telling myself to push through because Christmas break awaits on the other side. Bethel is known for rigorous academic instruction and wow, did my classes live up to that standard. This semester has definitely been significantly harder than my last two. Organic chemistry, an upper-level biology class and a foreign language have made my life a whirlwind for the past few months. I’ve spent long hours in the library, and studied more than I thought was capable of studying. However, this semester has also been the most rewarding. All of those studies have produced some good grades and stronger relationships and connections with professors that will last years into the future. Athletics also proved to be very challenging but very rewarding this semester. I started out cross-country season having just recently recovered from a foot injury, so I was a little nervous about how my season was going to go. Turns out, this season was my best yet. All of the mentally and physically taxing workouts were rewarded with a PR at our conference meet — the last one of the season. This semester has proven to be challenging, but rewarding in so many ways. I’ve also had some of the most memorable experiences with old friends and new alike. So just remember that your struggles — whether they are academic, athletic or personal — will reap benefits and rewards in some form or another. 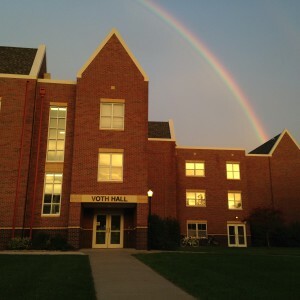 November 28, 2015 by Kiley Varney in Campus Life | Comments Off on Getting Excited for Gala! It’s nearing the end of Thanksgiving break. We all know what that means… it’s just about time for finals. But just before finals, we get the ultimate night of food, dancing and getting fancy: Gala! The Gala tradition at Bethel has been going on for years. It’s a night where students get dressed to the nines and have a decadent dinner served by the faculty and staff of BC in a very well-decorated Mem Hall. After dinner, we get to listen to some excellent jazz played by our fellow students. The president’s house is open for guests to come in, warm up and enjoy cookies and hot chocolate. Students can also take a horse-drawn carriage ride around the block — the perfect way to spend a cold winter night. Later in the evening, there’s a dance so that we can all get a little exercise and shake off a few of the many calories consumed earlier in the night. So study hard this week, and look forward to Gala on Friday (plus it’s Reading Day, so no classes!!!)! …but I say they’re wrong! My best friend Kendra and I share a room together in Voth Hall. We love being roommates and have had zero problems. I can really only think of the benefits of rooming with Kendra — no downfalls have come to mind. We are the type of friends that share everything, so it works out perfectly for us. One giant shared wardrobe. I think Kendra and I wear something of each other’s almost every day. The only problem is that we don’t know what we are going to do over breaks and over summer! Don’t want that whole bag of popcorn? That’s what I’m here for. We are always sharing food and eating each other’s leftovers. We each have our own food too, but none of it is really owned. Her mac n’ cheese is my mac’n cheese and I wouldn’t want it any other way. 3 a.m. laughing/crying sessions. This is a real thing! 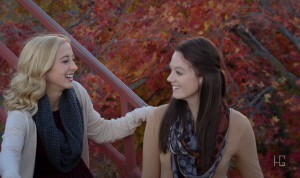 We have had times where one of us says something funny and we end up laughing until we can’t breathe. We’ve also had those nights where one or both of us are upset and really just need the other one. That’s one of the best things about having a best friend as a roommate. Honest opinions and advice. I know I can count on Kendra to tell me whether my outfit works or not before I leave the room. I can also depend on her to give me expert advice when I’m stressed or frazzled and just in need of someone to tell me that everything will be all right. Those are just a few of the countless ways that I’m thankful for having my best friend as my roommate. 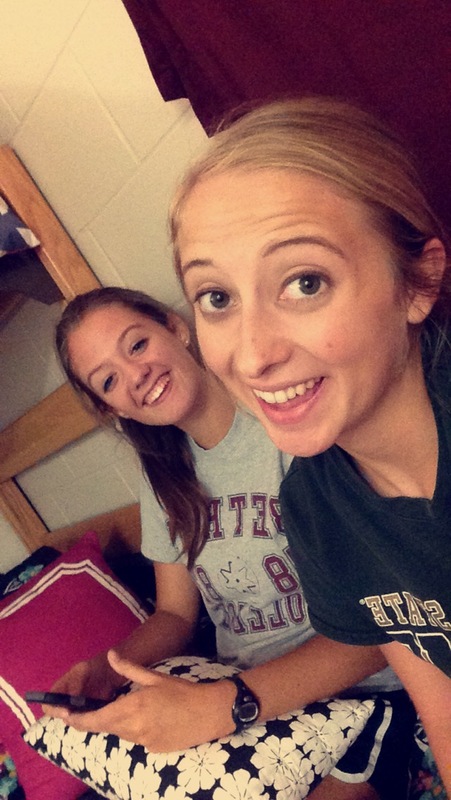 I know this situation might not work for everyone, but rooming with a good friend might just end up being one of the best things about college. So before you count it out, maybe give it a try. I’m sure I’m not alone when I say that this semester has really been a tough one. My classes are way harder than they were last year, extracurricular activities/jobs are taking up a significant amount of my time, and stress levels seem to be at an all-time high. Last week, I spent almost 15 hours studying for one test! My life felt so consumed by Organic Chemistry and I got to the point where I was making horribly cheesy jokes about syn additions and Markovnikov. I’m pretty sure my friends thought I’d gone off the deep end. I bet lots of you are feeling that way about your various studies and obligations by this point in the semester, too. We’ve got two more full weeks of class left, people! We can do this. I’ve decided to compile a list of a few tips that help me during stressful times. Do the tough stuff first. I am a huge advocate of making lists. When your day seems like it can’t be conquered because of the endless amount of things you have to do, writing down your obligations somehow makes everything seem a little more doable, and it makes the screaming/panicking voice in your head calm down a bit. Put the hardest things at the top of your to-do list and get them done early. Doing so will take the weight off of your shoulders and make you more motivated to carry on. Keep your space clean. You’ve heard it said “a cluttered desk = a cluttered mind.” I know you all probably aren’t as neat-freakish as I am, but regardless, I think we can all benefit from having a tidy place to study or relax. If you take a few minutes to pick up the clothes off your floor, organize all the stuff in your bathroom cabinets, or even just clear off your desk, it can really help relieve some stress. Cleaning/organizing my room is probably the first thing I do when I’m stressed. It helps me to feel like I’m getting things done and makes me feel better about the space I live in. Don’t overeat/under-eat. A lot of people tend to overeat or under-eat when they are stressed. Neither one is good for you and neither one will help you! Personally, I tend to under-eat when I’m stressed, which leads to irritability and lack of energy. The times that I do end up overeating though, I feel bloated and tired, because it’s usually candy or salty food that I binge on. So when you’re in the middle of cramming for your next test, be sure to snack on healthy food that will give your brain the energy to keep going. Check out this list of healthy, affordable snacks that are great for studying, and go stock up! Get away from the distractions. One of the worst places for me to get a lot of things done is in my room. There, I am tempted to take a nap, socialize and get distracted by so many things. My two favorite spots to study or get work done are Mojo’s and the library. I getting things done in Mojo’s because it’s often filled with other people who are engrossed in their work/studies. There’s something about having a hot cup of tea in that cozy environment that just makes me productive. The library is wonderful for many of the same reasons. It’s also very quiet most of the time, and there’s tons of space to find a place to dive in to your work. Many of those hours I spent last week studying for O. Chem were in the library. Dress up! I’m not saying you have to go full suit and tie, but putting on an outfit that you feel confident in can really give your brain a boost. Now that it’s getting really chilly outside, there are so many options like scarves, boots and coats to spice up your wardrobe. When I’ve got a big test or something coming up, I plan what I’m going to wear that day. One of my friends last year always wore a button-up shirt with dress pants on Anatomy and Physiology test days. He told me, “Dress well, test well.” And you know what? He got the highest score on every test in that class. Hopefully some of these insights can help you get through this last bit of the semester. Leaning on friends and family when you’re stressed can also be a huge help, so take advantage of that. The rest of the semester is going to be tough, but we got this!